A trip in Tintin's Borduria with Air Palombia. Your passport is not regular. Tintin by Herge, Metuhen (UK) and Little Brown (US) publishers. The unbearable neighbourhood of the syldavian kingdom is cause of strains. Will you try to escape? You'll get into a neighbour country, you don't no wich one. But it can't be worst than here.It can't, say? You prefer to call your ambassy? 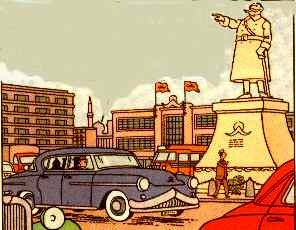 Art by Herge © Casterman. All rights reserved. This page is © Grard Courtial. All rights reserved.